Air Cairo is a low fare airline based in Cairo, Egypt. The airline is the low fare subsidiary of EgyptAir which operates scheduled flights to Saudi Arabia, Kuwait, Qatar, Jordan in the middle east, and inclusive tour flights to Egypt from Europe. Its main base is Cairo International Airport with the company head office in the Sheraton Heliopolis Zone. 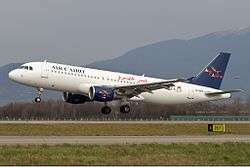 The airline was established in 2003 Egyptair acquired 60% of the airline, NBE 20% , Bank Misr 20% Airbus fleet. Recently, the company is re-modeling towards the low fare model which is planned to be the strongest low fare airline in Egypt. On 1 June 2012 Air Cairo launched its first ever scheduled flight from Borg El Arab Airport Alexandria to Kuwait International Airport, Queen Alia International Airport, King Abdul Aziz International Airport, Tripoli International Airport, Sabha Airport, Misrata Airport, King Khaled International Airport Air Cairo launched its scheduled flights from Hurghada International Airport to Belgrade Nikola Tesla Airport. But those flights were suspended in the end of December 2015 due to poor loads. ↑ "Air Cairo". ch-aviation. Retrieved 10 June 2016. ↑ "Airlines based in Egypt: Air Cairo". airlineupdate. Retrieved 12 June 2016. ↑ "." Air Cairo. Retrieved on 2 May 2010. ↑ "Directory: World Airlines". Flight International. 2007-03-27. pp. 53–54. ↑ "Air Cairo - Fleet". planelogger. Retrieved 2 July 2016. ↑ "Air Cairo fleet details". airfleets.net. Retrieved 2 July 2016. ↑ "Air Cairo Fleet Details and History". planespotters.net. Retrieved 2 July 2016. Wikimedia Commons has media related to Air Cairo.